John Milton said, “the childhood shows the man, as morning shows the day.” I think a lot of us participating in today’s School Picture Day are hoping that isn’t true. School Picture Day was the brainchild of Leanne Shirtliffe (Ironic Mom) and Clay Morgan, with Keenie Beanie’s help. Here’s her original post last week explaining it, along with one from Leanne. It’s okay to laugh, really! In choosing these, it was my thinking that they got better over time. Perhaps, but only the way nuclear reactor contaminants in the environment get better over time. You know, half-life. The first one, from kindergarten…is that a small mammal on my head? My mother tells me that she sent me to school that day looking a lot neater than that. The photographer apparently took it just after Dorothy’s house blew on to our playground. Obviously, no one had a comb, either. When I see the second one, after all these years, I think “Marcia, Marcia, Marcia!” a la Jan Brady. Really diggin’ the matching hair ribbons, too. Nothing can help those glasses, though. Finally, the senior picture. Not bad, but it doesn’t give you a sense of the typical early 80s big hair and makeup. 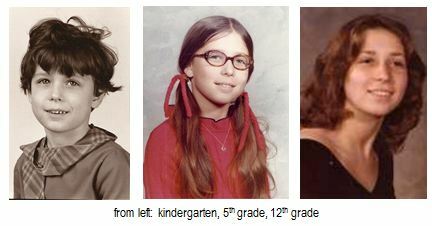 I was sort of a nerdy girl and out of sync with fashion. I don’t think I really discovered makeup until college. Well, whether or not Milton was correct about childhood showing the man – or woman, it was a fun memory ride. Thanks for indulging me! So, what pictures of yourself make you laugh? Which one best evokes your childhood, in your mind? It is nice to meet you this way. You know when we are making ourselves all vulnerable and stuff. Okay, kindergarten may have been rough, but you definitely improved. Big time. I find hair really does help. Here’s my pic if you are so inclined. Deep cleansing breaths. Thanks, Renee! I will definitely check out your pic. Nice to meet you, and glad you stopped by! I love your photos! The kindergarten one looks like Scout from To Kill a Mockingbird. It’s perfect! Now that you mention it, I can see that! I don’t think my mom saw it that way when the photo came home, though. But it’s a riot now! Thanks, Jess, for stopping by. Now you have to put one up, too! I also love the progression of pictures. Brilliant and beautiful! I’m getting a lot of Scout references. It’s a shame I blew all my kid actor potential. Thanks, Leanne, for checking me out, and for such a great idea! “Tamed the mammal” – I’ll have to remember that. (Leanne would add “if you know what I mean” – lol). Loved your pic, too, Piper! Thanks for your comment. Why, oh WHY, do they take pictures after recess! The same thing happened to me a couple of times. Those pics are great. “Tamed the mammal” is awesome. I’m going to use that in reference to combing my sons hair. He’s determined to grow it out and it’s incredibly thick. Not sure how long I’ll be able to tolerate it! Thanks, Annie, for stopping by! Loved your shoulder pads pic, btw. Kathy, you’re quite lovely! Thanks for sharing your photos. I feel like I can relate to you. I was never that girl who fit in. But that was the good thing about senior portraits – everyone had to wear the same thing, even the popular folks. I agree with you, the pictures get better through time. I laugh most at mine from my childhood because the 80’s styles and trends were hilarious, even for those of us on the outskirts of what was “in.” Thanks for stopping by my page and commenting! I love the photos, almost as much as your commentary. I am seriously loving making the rounds today. Oh, me too! I feel as if I’m really getting to know some of my fellow bloggers a lot better in the process. So glad you stopped by, Jess! Love the photos! It’s so fun to look back. KB – If I had to match those three photos in a guessing game, I wouldn’t have picked them as all being you. The kindergarten hair is hilarious but I’m now wondering how much effort it took to tame your locks for the 5th grade version. Thanks for linking up and joining in the School Photo Day fun! Thanks to you, Keenie! I liked your “supermodel pouty look” in your senior portrait, and the other hilarious pics. I love these pics! I have some in a dusty box very similar to them. In fact, I’m sure I had those glasses at one point. But instead of ponytails, I wore braids. You do look like Scout in the first photo. Were you a tomboy? Is that even a word nowadays? I was considered a tomboy because I climbed trees and loved being active. As opposed to being a girly girl, I guess. To the perpetual despair of my mom, I was more interested in rolling down hills and collecting rocks (and sticking them in my pockets) than I was in looking presentable. Sometimes, I wish I hadn’t grown out of that! I think our generation made it easier for girls later on to be more active – and scruffy? Thanks for coming by and commenting! We want to see your pics! Okay, Kathy, you asked for it. I’ve posted my photo on my blog, just for you! Come by and visit when you get a chance, LOL!